Hi! The Inbreds will be doing a one-off show in September as part of Dave's Sandbanks Music Festival in Prince Edward County. It will be the fourth year for this event and it's always a great time with camping, local food trucks, local drinks, original art on stage and free kid's programming all day. There are six other great Canadian bands on the bill and the headliner is Great Lake Swimmers. Advance tickets are just $30 and the event has sold out the past two years, so definitely buy early if you can. The event runs from 2:00-8:00 pm so it's great way to spend the day and then either stay over in PEC, or drive home. Camp if you can! Click here to buy your advance tickets right here! 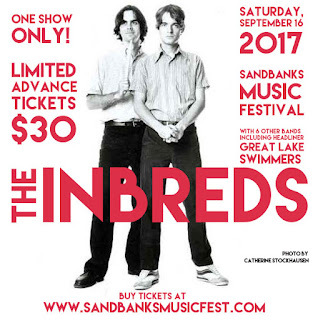 Click here to learn all about Sandbanks Music Festival right here! Hello again! 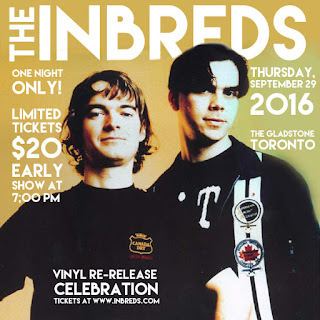 We are playing a single matinee show in Toronto at the Gladstone Hotel on Thursday, September 29 at 7:00. The event is to celebrate the re-release of our last three albums (Kombinator, It's Sydney or the Bush, Winning Hearts) on vinyl, via Toronto's Label Obscura. More specific details on the vinyl release will be coming later this summer, but here is your chance to buy a pre-release package with all three records. CLICK HERE TO BUY THE PRE-RELEASE VINYL 3-PACK. For now, CLICK HERE TO BUY TICKETS on Zunior.com. The Gladstone Ballroom is a great room, but it is modest is size so there are a very limited number of tickets available. If you are interested in going, please buy now before they sell out. Our friends The Lonely Parade from Peterborough are opening the show, so make sure you arrive in time to check them out too. Want a great in-depth update on the band? Check out this article by Cam Lindsay in Vice from June 2016. 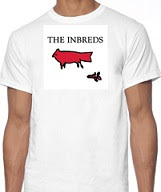 This good ole' Blogger site will become the new home of Inbreds.com. I used to keep up a couple of old school versions of the original websites from years back, but they can barely stand up straight these days. So it's time for some something simple and free. If you look at the menu on the right, you'll see all the content moved over from the old site(s). Stay tuned for some new stuff coming in 2016 with some Inbreds classic album reissues. We have only ever played a few shows since 1998, and there are no immediate plans for any more, but we did have a very cool opportunity to play for the first time ever in Newfoundland in 2012 at the Lawyna Vawnya music festival, and if you want to see what our bonus 'secret show' looked like, check out the video below. The Inbreds - Any Sense Of Time from HEAVYWEATHER on Vimeo. You can get all of Mike's solo albums here. You can get all of Dave's solo albums here.